On a global day of action for sexual and bodily rights in Muslim societies, Malaysian students stood against harassment in public spaces. The organising team from Sisters in Islam sported shirts reading “Muslim Women Speak.” Credit: CSBR.“Cats are cute, catcalls are not”; “Don’t keep calm and stop sexual harassment”; “My name is not baby.” These were some of the slogans on signs floating above a group of about 40 people gathered at Petaling Jaya city council square, in greater Kuala Lumpur last month. The university students and activists chose to highlight fights against street harassment in the Malaysian capital as part of the annual ‘One Day One Struggle’ campaign, on 9 November, organised by the Coalition for Sexual and Bodily Rights in Muslim Societies. Armed with audio samples of common verbal insults and catcalls, they invited passersby to listen, share their own experiences, and show support for the anti-harassment campaign. Credit: Empower Malaysia. University of Malaya students conducted a survey with 113 respondents on campus. 80% said that they had experienced sexual harassment in public spaces before. There is little official data on street harassment in Malaysia. There are statistics on gender-based violence, but street harassment specifically is poorly documented. Credit: Sisters in Islam.Activists participating in the anti-street harassment action posed for a photo. One member of the team captured it on video. Sisters in Islam, one of the organising groups, is a leading Malaysian organisation advocating for women’s rights within the framework of Islam and human rights. Credit: Sisters in Islam.Passersby were intrigued by the campaign. Some stopped to listen to audio samples prepared by students with examples of common verbal insults and catcalls. This creative tactic was designed to encourage reflection and conversations on how one could respond and intervene when witnessing street harassment. Credit: Sisters in Islam.University students talk to members of the public collecting pledges to combat street harassment. The action engaged passersby to think of everyday personal actions they could take to build a culture of respect. 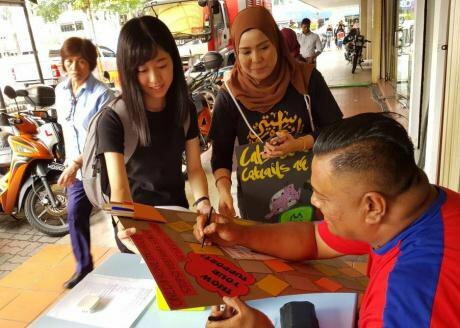 Credit: Sisters in Islam.Sisters in Islam staff member Zaffan Ariffin acted as a ‘group leader’ for five university students talking to the public to raise awareness against street harassment during the action. They used sandwich boards to highlight unwanted sexual advances that women commonly hear on the streets. Credit: CSBR.Volunteers hold signs asking drivers to “Honk if you’re against sexual harassment”! Suraidah, one of the organisers, said tackling mindsets is one strategy against street harassment. Another is anti-discrimination law and policy. The group aims to amplify women’s rights within the frameworks of Islam, universal human rights, and democratic politics.